Around spring 2016, three Twin City Supermarkets, which I believe were all owned by the same people, switched from Twin City to a new store banner, Aquí Market. (Aquí means "here" in Spanish.) 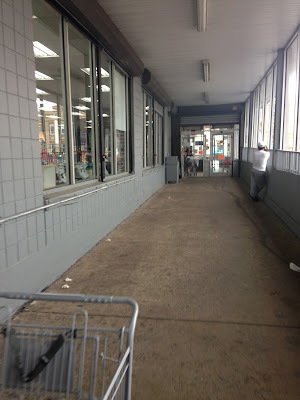 The locations were at 2-16 Garfield Ave, Jersey City, NJ (a former ACME that became a Fine Fare, then Twin City); 216 Sip Ave, Jersey City, NJ (this one); and 617 E Main St, Bridgewater, NJ (which I believe is still co-branded Twin City/Aquí). This store opened in the 1950s as a Safeway, then became Finast (First National Stores). 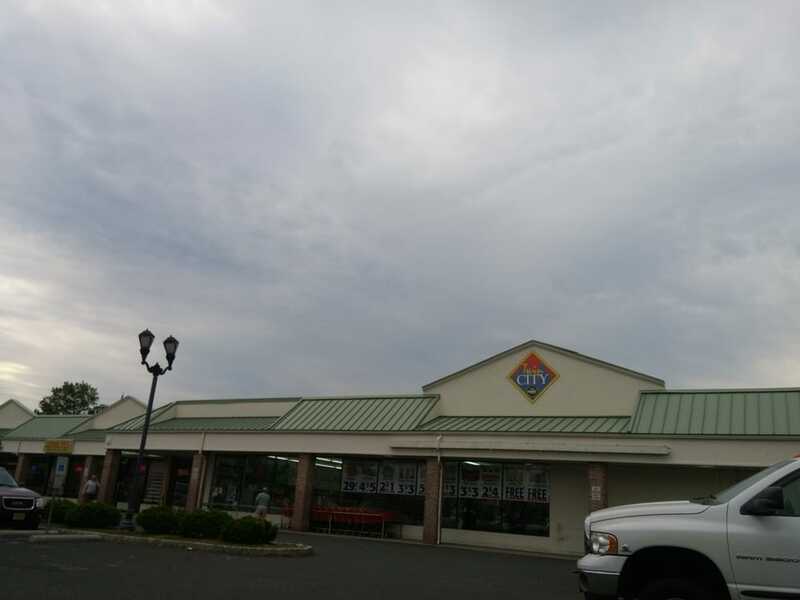 After Finast closed, a ShopRite opened here, before closing in the mid to late 1980s. 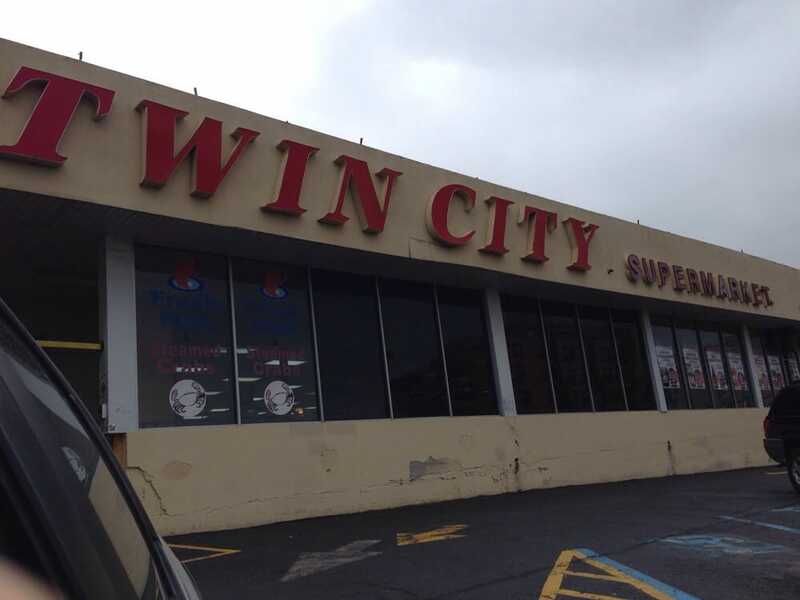 Twin City opened some time after; I don't know how much time was in between. Thanks to JoshAustin610 and Styertowne on Flickr for the history! Photo of the store pre-rebrand. From Yelp. 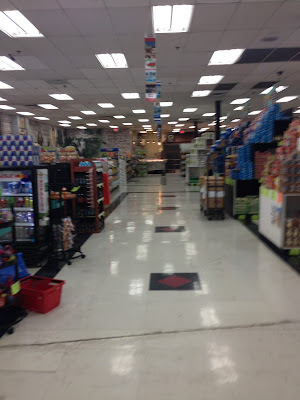 The conversion to Aquí Market consisted of a repaint of the entire building (which desperately needed some work, it seems), along with a decor swap inside and new bags and circulars. Little to no structural work was done here, while it seems the location on Garfield Ave had a much more extensive upgrade, while Bridgewater was somewhere in between. Today most of the facade is actually blank, and I have to wonder if there are or were plans to install a real sign in addition to the painted-on sign centered on the front. Close-up of the new logo. It's actually pretty cool but does not light up at night (and does not have any lights on it). To enter the store, you walk up a long ramp behind closed-in windows. There is a foyer straight ahead, as there is also an entrance from Sip Ave. Josh's photo shows that side entrance. Upon entering, you're greeted with a large produce department. The produce prices were great - everything else was ridiculous! I do like these wall graphics, even though they're all only decals. One of the really great prices here was a weekly special on bananas, for only $0.29/lb. You don't see that every day! I don't understand why a store like this keeps its single-tiered produce cases. They could fit so much more along the two sides if they used multi-tiered refrigerator cases like these (on the left). The back wall is soda and beverages, with dairy under the blue section. Meat, seafood, and deli are all located in the last aisle. The wall graphics are great. The aisle markers are horrible. Click on the picture to zoom in. They are SO ugly! The back corner of the store. 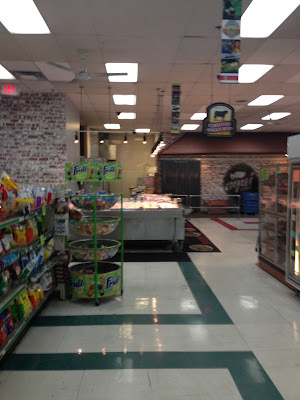 The deli/meat department goes along the wall to the left, with seafood in the front. There's a strange alcove in the front corner past seafood that is looking pretty empty here now. Based on the flooring, I'd guess it used to be a service department of some kind, but I have no idea what. The flooring is kind of crazy here! The freezer aisle, still with coffin cases down the center. The blue wall is looking pretty empty here. Why no exciting dairy graphics? This store was very quirky, though, like the crazy flooring and the weird alcove in the front. Here's another quirk - a water cooler with paper cups for customers! The boy on the right in this photo is standing right next to it. I've seen water fountains before, but never a cooler with bottled water. One last look along the front end back towards produce. Aquí is a refreshing change from the cookie-cutter Stop & Shops and ACMEs, but just too expensive for any regular shopping. It's fascinating to see so many eras of supermarket decor and fixtures combined in one place. So if you're ever around Journal Square in Jersey City, check it out. But I wouldn't make a special trip. Food Bazaar Coming to Manhattan!